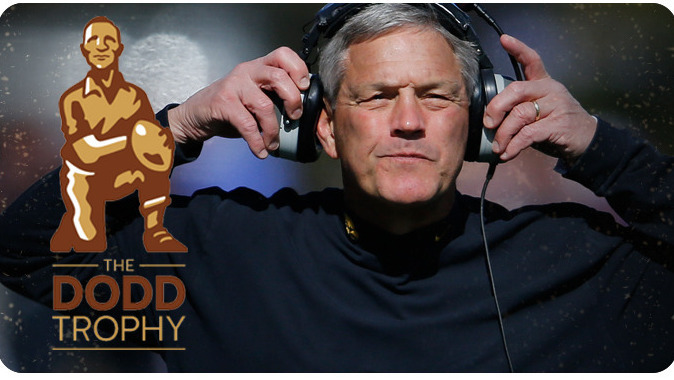 IOWA CITY, Iowa -- University of Iowa head football coach Kirk Ferentz has been named the recipient of the 2015 Dodd Trophy. The announcement was made Wednesday by the Bobby Dodd Coach of the Year Foundation and the Chick-fil-A Peach Bowl. Presented annually by the Chick-fil-A Peach Bowl, The Dodd Trophy, college football’s most coveted coaching award, honors the head football coach whose program embodies the award’s three pillars of scholarship, leadership and integrity, while also having success on the playing field throughout the season. Ferentz has also been recognized as the Eddie Robinson Coach of the Year (FWAA), the Woody Hayes Coach of the Year, presented by the Touchdown Club of Columbus, and the American Football Coaches Association (AFCA) Region 3 Coach of the Year. Ferentz was named both the Dave McClain and Hayes-Schembechler Big Ten Conference Coach of the Year on Dec. 1, marking the fourth season he has earned the league honor. Ferentz is in his 17th season as Iowa’s head coach. He guided the Hawkeyes to a perfect 12-0 regular season mark, the most wins ever for a Hawkeye football team. Iowa, ranked fifth in the College Football Playoff (CFP) rankings, has earned a spot in the 2016 Rose Bowl against Stanford (Jan. 1, 4:10 p.m. CT, ESPN). The Hawkeyes lost to Michigan State in the Big Ten championship game, 16-13 after winning the West Division. The Hawkeyes began the season unranked, before moving into the top 25 following a 10-6 win at Wisconsin. Iowa steadily climbed in the rankings and was ranked as high as fourth in the CFP rankings. Ferentz ranks seventh in Big Ten conference wins (76) and eighth in total victories (127). He has led Iowa to 13 bowl games in the last 15 seasons, including eight January bowl events. Ferentz has led Iowa to nine first-division finishes in the Big Ten, including winning the conference in both 2002 and 2004. Iowa has won seven or more games in seven of the last eight seasons, including eight wins in 2010 and 2013, nine wins in 2008, 11 wins in 2009, and a school-record 12 wins in 2015. Ferentz has been very involved in his local community, having served as the honorary chair of the University of Iowa’s United Way campaign and currently serving on the National Advisory Board of the Bethesda Family Services Foundation. He and his wife, Mary, have given multiple major financial gifts to the University of Iowa, including a $400,000 gift to the University’s College of Liberal Arts and University’s Children’s Hospital and a $100,000 gift to the University’s College of Liberal Arts. They have also served as advocates for the Children’s Hospital across the state by hosting and speaking at events to raise support for UI Children’s Hospital, to their personal generosity in establishing the “Ferentz Family Pediatric Research and Education Endowment Fund” in 2007. With a head coach leading by example, members of the Hawkeye squad have also thrived in the community. A crucial component of character building for the Hawkeyes is community service. From 2013 to 2015, the Iowa football team combined for more than 1,500 community service hours. While Ferentz has guided the Iowa program to great success on the field, the Hawkeyes have also made their mark in the classroom. In the most recent release on academic standings, Iowa’s football team compiled a Graduation Success Rate (GSR) that ranked above the national average. The 2014-15 Academic Progress Report (APR) showed a score of 966 for Iowa football, a score that ranked 10 points above the national average for football programs. In addition, defensive back Jordan Lomax was named to the CoSIDA Academic All-America second team. The senior who finished third on the team in tackles earned academic All-Big Ten honors each of the past two seasons. Lomax carries a 3.49 GPA, has been a member of Iowa’s Leadership Group the past three seasons and was named the Lott IMPACT Player of the Week in November. Six of the nation’s top head coaches (Mark Dantonio, Kirk Ferentz, Jim McElwain, Ken Niumatalolo, David Shaw and Dabo Swinney) were named finalists for this year’s award by a panel consisting of all previous winners, national media, a member of the Dodd family and a College Football Hall of Fame member.